Subway Surfers Game is not only game. It’s one of the most popular games for Android, iOS or PC. Do not know what is Subway Surfers? How is it possible? Let’s go to preview! 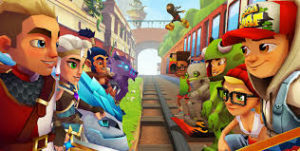 Subway Surfers was released four years ago, on 24 May 2012 from developer Kiloo. 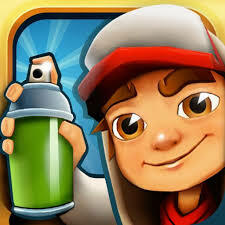 Subway Surfers is primary an mobile game available on Android, iOS, Kindle and Windows Phone. You will play the role of teenage and try to escape away from the Inspector and his dog. The game will starts when Jake, a handsome young graffiti artist is working on his graffiti near the subway. Run and escape or Inspector will catch you! Dash as fast as you can! Subway Surfers is one of the most popular game in the mobile world. Game have more than 1 000 000 000 players and you will be one of them! Trust me! Of course, Subway Surfers is free to play! You can download Subway Surfers for free without any payment! Game required mobile phones with Android 4.0+ or iOS 7.0+. Do you like this game? Let’s go, download it for free! You can download Subway Surfers on Google Play for Android. For iOS download Subway Surfers here – iTunes. Or unofficial PC version for download. Also available on Kindle! You can free download Kindle version on amazon. Some wallpapers or utilities you can find in download page. Jake is the default character and the mascot of Kiloo. Jake appears in game icons. The Inspector and his Pitbull dog chase the characters. While they are always the same character, his uniform changes according to the location.